Primary Possibilities: Music, Organize, and Dollar Deal... OH MY! I have been wanting to post about this topic for a long time. Now, Amanda at Teaching Maddeness has created a linky for this topic! Yeah! I am so excited! I have two young children at home who watch Nick Jr. ALL THE TIME! I constantly hear these songs in my head! Just check them out, then I will proceed with my thoughts. #1- It is a visual and cute jingle that the students are already familiar with. #2- Routines make for easier transitions and time management. #3- PBIS (Positive Behavior Interventions) create for a positive classroom environment. Also... This is off topic, but... I also wanted to share a TREASURE I discovered with a jewelry organizer. Check out these pictures. I organized all my magnetic letters in alphabetical order on one side. On the other side, my Saxon Phonics letter cards fit perfectly! 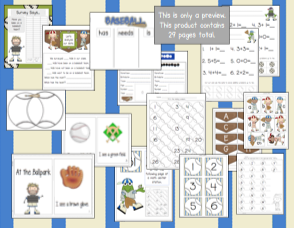 Lastly, I am trying to hit a personal goal in my TpT store this quarter. 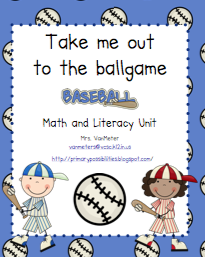 I have my Baseball Mini-unit on sale for $1.00 until the end of June. This is your chance to start your school year with a HOME RUN! Please look at the preview below and click to purchase your copy today (for only $1.00)! My son loves the Bubble Guppies! It's Time For Lunch- would be a transition song for right before lunch. Fun music! I've nominated you for a Versatile Blogger Award! Stop by my blog to pick it up!